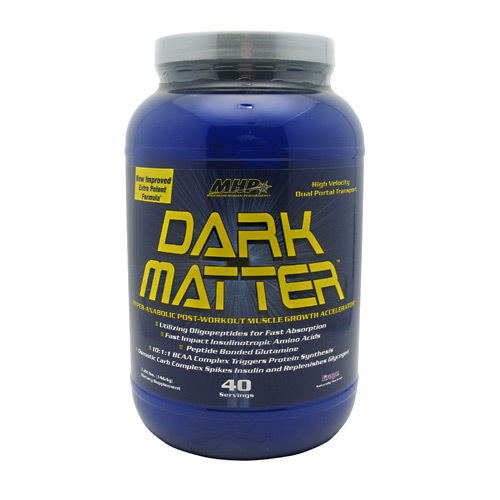 MHP Dark Matter is naturally flavored and great for after your workout. Advertências: Keep out of reach of children. Diabetics should consult with their physician before using. Recomendações de uso: Dark Matter is a Hyper-Anabolic Ultimate Post-Workout Muscle Growth Accelerator designed to be taken immediately after your workout. Add 1 scoop to 8 fl oz of water in a glass or shaker bottle immediately after training. (For maximum results, you may take 2 scoops with 16 fl oz of water.) Stir or shake vigorously before drinking.